Adjustable handle, focusing, retractable hang hook. Rubberized non slip base and handle. Sliding, variable-focus on/off switch adjusts light from a spot beam to broad area illumination. Carrying handle folds down into a convenient table-top stand. 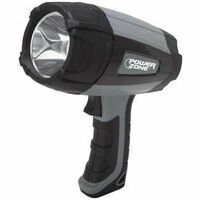 40 lumens, 220 hours run time, 26 feet beam distance. Uses 4 D batteries, (not included). ABS body, 5.05"W x 6.94"L, .90 lb. Rotating bezel to change from spot to flood. Power switch has 4 settings: High, med, low and strobe. 504 high, 365 med, 202 low lumens. 4 hours 16 minutes, 6 hours 9 minutes, 13 hours 28 minutes run time. 418 meters high, 367 med and 274 meters low. Uses 4 C batteries, included. 7" L x 5.63" W x 3.44" H, 1.15lb. Pistol grip locking trigger.